An inspiring day was organised in Aalborg to celebrate the 250th anniversary of the Surveying Profession in Denmark. 2018 marks the 250th anniversary of the Danish Surveying Profession. 250 years ago, in 1768, the Danish King Christian VII recognised surveying as a profession when the two first surveyors were appointed by the King. This means that surveying is one of the oldest recognised professions in Denmark. 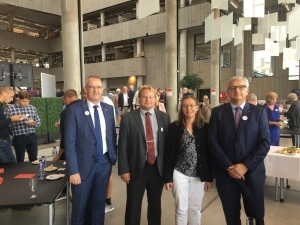 This is worth a celebration and the Association of Danish Surveyors, DDL, together with Aalborg University that educates surveyors in Denmark and the Danish Geodata Agency had invited to a day of celebration at Aalborg University. FIG was represented by the office, Louise Friis-Hansen and Claudia Stormoen Pedersen. 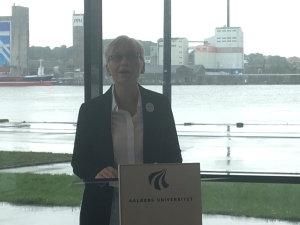 300 surveyors gathered at Aalborg University for this celebration and there were inspiring addresses by Minister of Energy, Utilities and Climate, Mr Lars Chr. Lilleholt, Mayor of Aalbor Thomas Kastrup-Larsen, Head of Aalborg University, Per Michael Johansen and CEO Pia Dahl Højgaard, the Danish Geodata Agency. All competently facilitated by President of the Association of Danish Surveyors, Torben Juulsager. DDL is member of FIG as well as Aalborg University is Academic member and the Geodata Agency is an affiliate member of FIG. The first cadastral map in Denmark was developed in 1844, and the surveying profession has had a significant impact on the development of the Danish society. However few people recognise this as the work done by the surveyors is often not so visible. Originally surveyors were educated in Copenhagen, but in 1974 a big step was made and the education was moved to Aalborg University. The surveying students are quite visible in the city of Aalborg - especially with their yellow and orange vests. Aalborg City seems also to be inspired by the surveying education, and the city is in its city planning a vital example of progressive, inspriational and innovative city development. This was also pointed out later in the day when there was a walk around strategic buildings and sites where surveyors have set their creative and innovative marks. 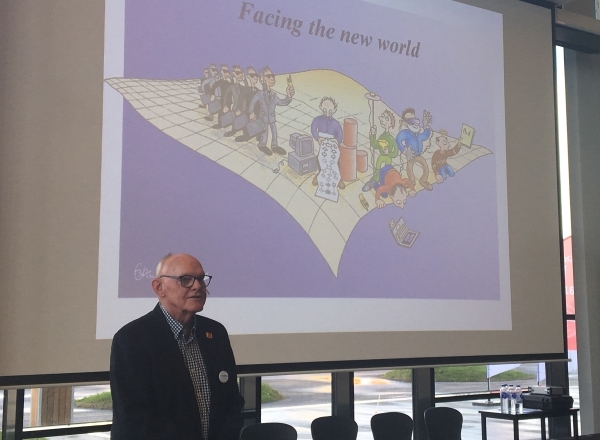 After the welcome addresses, Stig Enemark, Professor Emiritus at Aalborg University and former President of DDL and also of FIG gave a key note presentation on his thoughts on the development of the profession in the past-present-future with an international perspective. The profession has developed significantly over the years and today, surveyors undertake many different tasks. 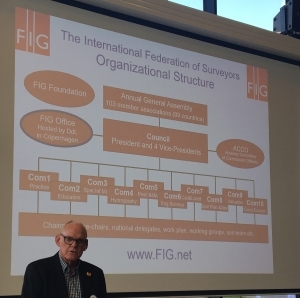 Stig Enemark talked among other things about the importance of cooperation - nationally and internationally, awareness of the identity of the surveying profession and Spatial digital management. The various cadastral systems around the world provide different perspectives and challenges. Important for both a national and international agenda are the 2030 UN Sustainable Development Goals. Recent development, e.g. the rapid urban growth, climate change impacts and digital possibilities creates new challenges for surveyors and their work. In order to address these changes and challenges there is a need to change view from being Land Surveyors into being Land Professionals. 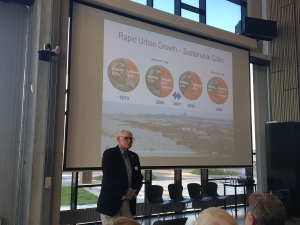 Torben Juulsager, President of DDL took up one the challenges that Stig Enemark pointed out, and invited the other stakeholders in Denmark, Aalborg University and Geodata Agency to work together on the UN Sustainable Goals and especially goal 1.4 that is specifically directed towards the work of surveyors. Aalborg University is situated at the waterfront, and after the key note presentation there was a walk around the buildings at the waterfront, and one of the measuring boats invited to "open boat" with an interesting tour and talk about their work, how they measure the seabed and hydrography surveying in general. An interesting exhibition "living labs" and exhibition was presented showing different areas of surveying. At the following dinner, Jean-Yves Pirlot,CLGE, sent his greetings to the Danish surveyors, and there were also greetings from Norway by Leiv Bjarte Mjøs and Arvo Leikenes, from Finland by Paavo Häikiö, and a greeting from FIG by Louise Friis-Hansen. CEO of Geodata Agency Pia Dahl Højgaard talked about the Geodata Agency and also entertaining stories about her experiences as a female surveyor. CLGE was represented by Jean-Yves Pirlot and Vladimir Krupa. Paavo Häikö represented the Finnish surveyors, here with Louise Friis-Hansen, FIG Office.